The desk itself was made of particle board and cardboard and had been moved a few times so it wasn’t as stable as it could be anymore. So we wanted something more stable. The desk was designed for use with a PC complete with full tower. While someday when I have a mega crazy design studio I may go back to a PC system, for now we’re both on Laptops, so the cabinet at right is weird and useless as we have no tower to hide. That window, while letting in beautiful light, is immediately next to our building’s front door. And we live on the ground floor. ….not an ideal view into our bedroom for the neighbors. The desk doesn’t really allow much his/hers organization or space. While we generally integrate a lot of our things, we each have different definitions of ‘organization’ so it would be nice to have some separate storage. 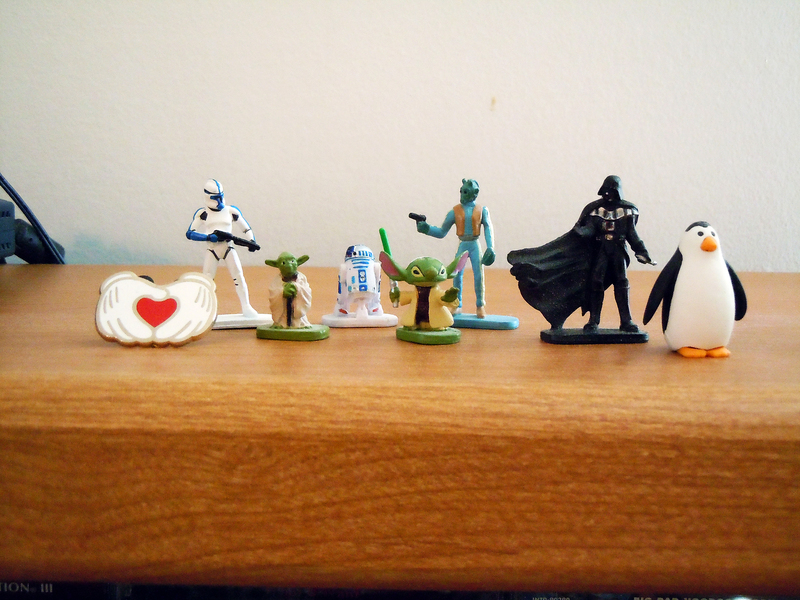 So after consulting with the characters that lived on our current desk, our priorities were clear. We wanted a clean office solution that provided space for both of our belongings, with privacy from the front door. Bill and I spent MONTHS looking at options, and even at one point bought an old kitchen table with the intent to re-finish it and add drawers. We decided that was a bit optimistic of an idea without having a real workshop available to us. Then, on one random trip to Ikea (because, that’s a fun date night to us), we found this guy. While upside-down and in the back of my car, rest-assured this is the beautiful and clean-lined Alex desk from Ikea. It features 2 wide drawers — perfect for his & her storage! Plus clean lines, and this puppy was from a display so it was in the As Is section for 30% off! We brought it home, but immediately realized there was one problem. While the clean lines and simplicity of the desk were great, it had a lot less storage than our old desk. And also, while we didn’t like how small the cubbies were above the old desk, we did like that extra vertical storage. Clearly we were going to need some shelves! With the window above, but not center, we decided to work this for a unique, a-symmetrical approach. I can’t believe this photo is on the internet. Sorry mom! So I mentioned we added the shelves to increase storage space. 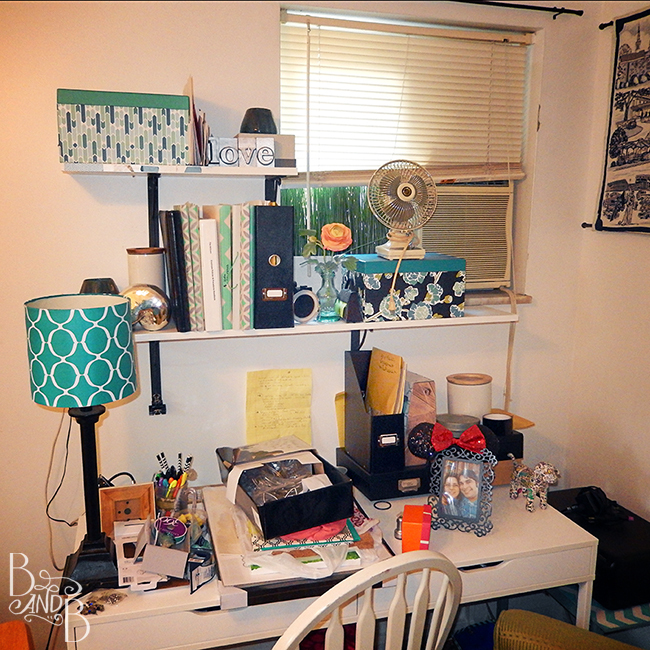 And in our last post, I highlighted the storage boxes we used on the printer stand (peaking out at right in this photo). Buuuuuuuuut then we had to actually move things into those boxes, throw out the dried-out pens, pair things down… who wants to do that? And more importantly, we still had not solved the problem of privacy with this window. 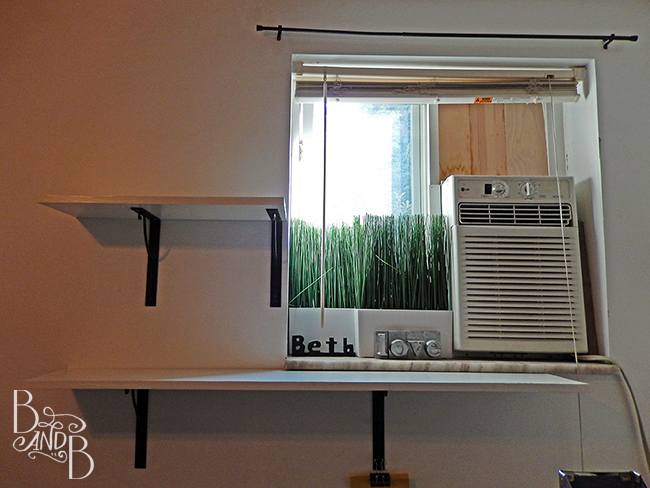 We have ugly blinds, and fake grass — but, I mean, really? FUGLY. And both of those things, while creating privacy, also blocked the light. No bueno when your apartment doesn’t get a lot of natural light to begin with. Enter, contact paper! Ahhhhhh, So much better than seeing our neighbors walking by. 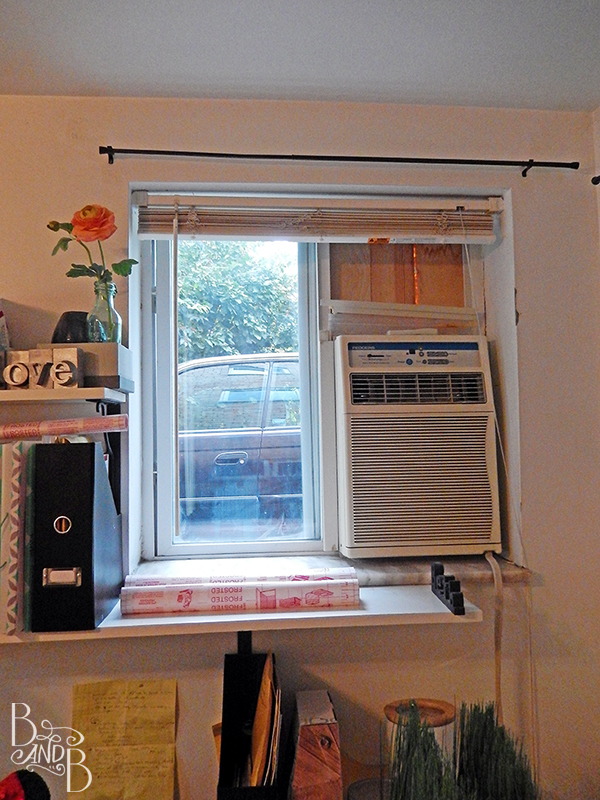 BUT, that still leaves our ugly air conditioner hanging out there. If this was our house and we had a garage or a basement we could store things like this in the winter, we would likely take it out seasonally. But this is apartment living, folks. We get ugly eye-sores all year long here! But, wanting to come up with a creative way to dress it up, like we did for the intercom panel, we brainstormed a bit. And the obvious option, was to include some fancy curtains. 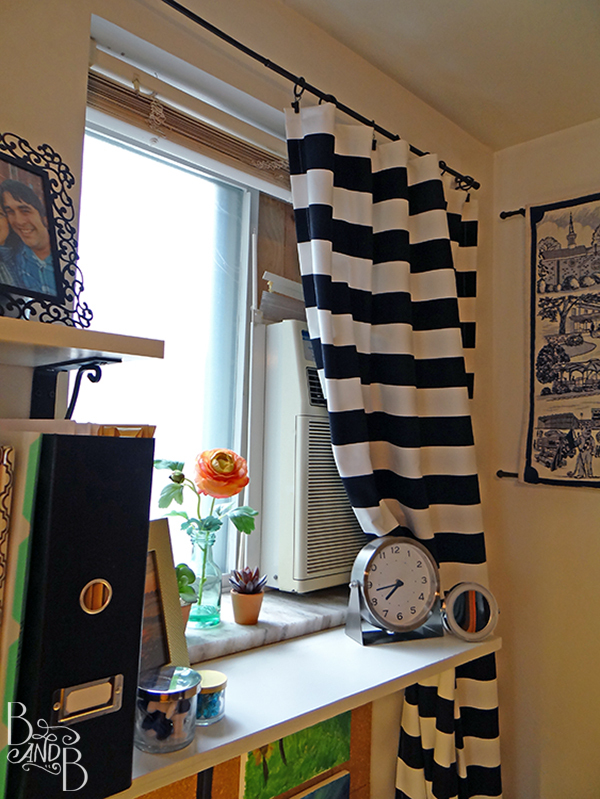 I knew I wanted to keep it simple, and take advantage of the curtain rod that was already above the window. 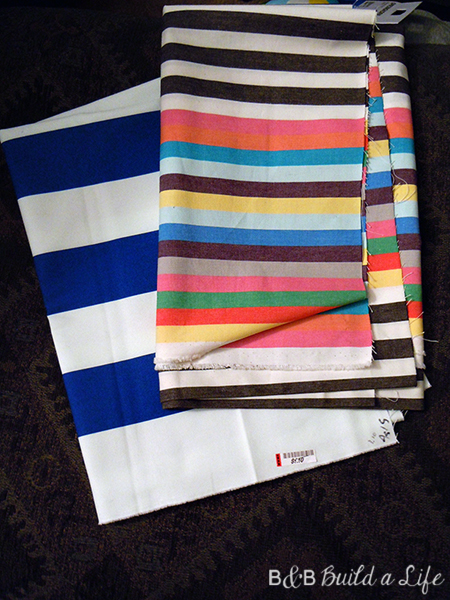 So I cracked open my fabric stash and found a few fabulous panels of striped fabric I scored in the As Is section of Ikea AGES AGO. I first shared them when showing off an easy pillow cover. While I used the rainbow stripes for the pillow, I still had the bolder, blue stripe fabric, as well as a matching black piece too. With a few quick hems to clean up the edges, and some simple drapery clips, we were in business! 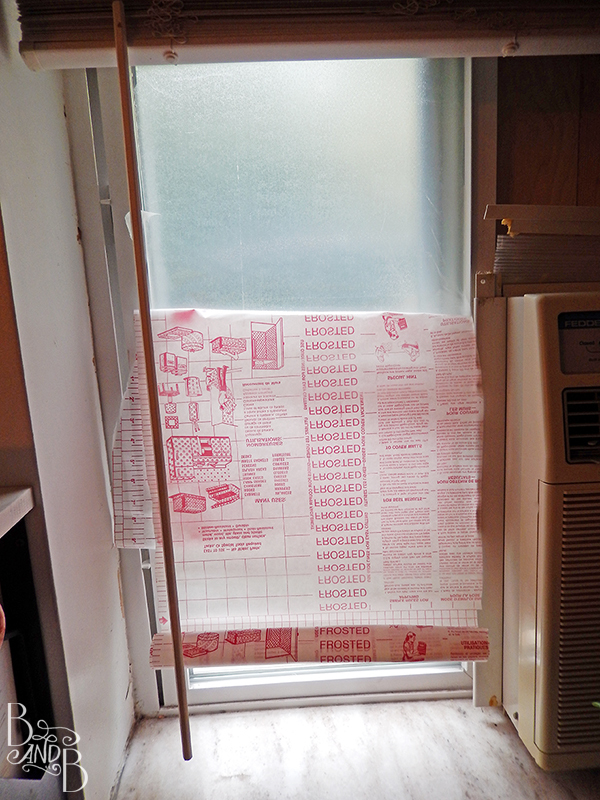 The curtain has enough weight to it that it’s able to easily hang in-front of the edge of the air conditioner when it’s in use, without blowing all over the place. And when we’re in the colder months, we can pull the drape over more and help make it fade into the decor. 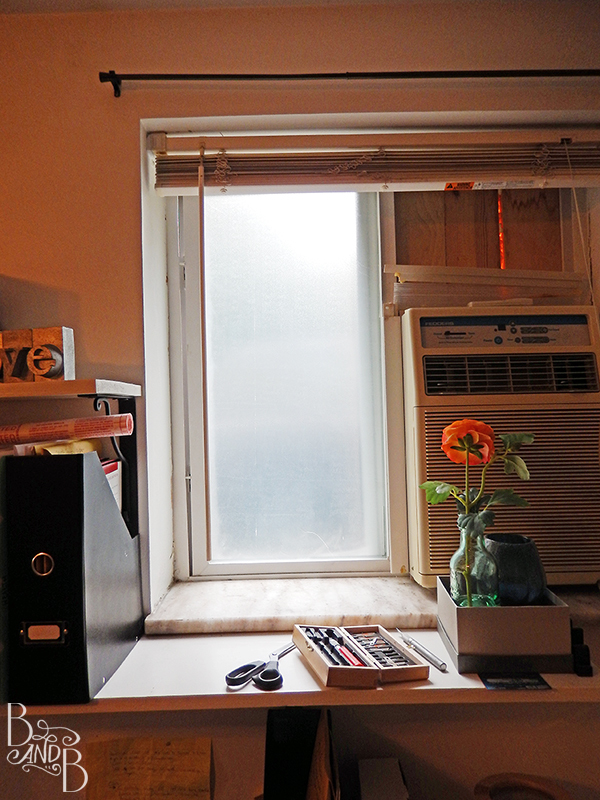 So, now we have shelves, privacy to the window, storage in clean boxes…. we’re done! Ok, full photos tomorrow, promise!